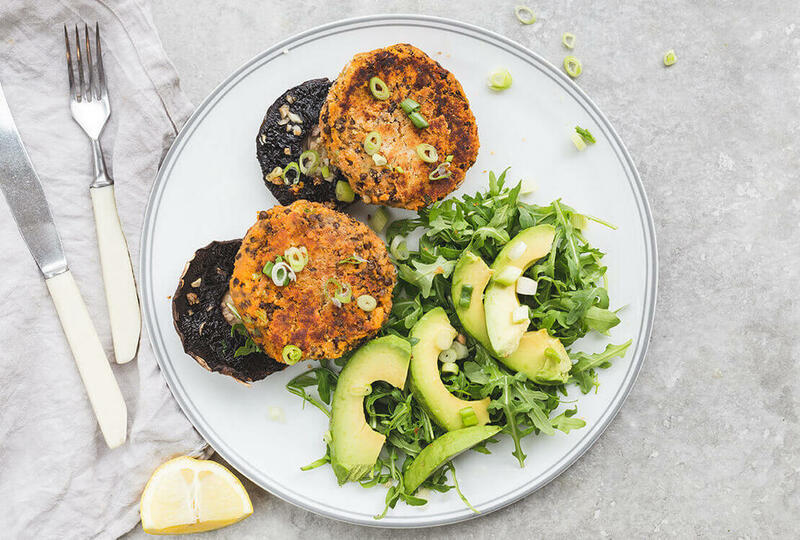 Sweet potato and black beluga lentil burgers are topped with creamy avocado and served on portobello mushrooms. 2. Peel and chop the sweet potato into 1cm pieces. Place in a saucepan and cover with boiling water and add a pinch of sea salt. Simmer for 10 mins until softened. 3. Meanwhile, finely chop the garlic and remove the stalks from the portobello mushrooms. Place the mushrooms on a baking tray and sprinkle over the garlic, a pinch of sea salt and drizzle over 1/2 tbsp oil. Place in the oven for 10-15 mins. 4. Finely slice the spring onions. Peel and de-stone the avocado and slice thinly. 5. Drain and mash the sweet potato. Drain the black beluga lentils and mix with the sweet potato, the spring onion, smoked paprika and only half of the coconut flour. Season with sea salt and black pepper. Form the mixture into 4 burgers and dust in the remaining coconut flour. 6. Heat a frying pan with 1/2 tbsp oil and fry the sweet potato and lentil burgers for 3-4 mins each side until golden brown. 7. To serve, place the sweet potato and lentil burgers on the mushrooms on two warm plates. Serve alongside the rocket and avocado slices and drizzle over the juice from the lemon.